Add issues automatically by sending emails to Backlog. Have you ever missed inquiries from the contact form or gotten confused about the status of the inquiries? Try adding issues via email on Backlog to overcome these problems! Forwarding inquiries from the contact form to the email address will create new issues regarding those inquiries on Backlog. Issue details such as the assignee, deadline and category can be registered and shared among project members for smoother operations. Please refer the page below for details. Previously, once issues are added on Backlog, they cannot not be deleted. We believed that it is important to keep all issues recorded even if they have been added by mistake. 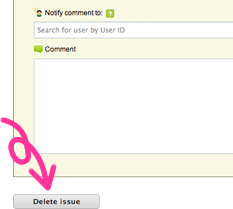 However, many users have voted on our feedback forum for the option to delete issues on Backlog. Therefore, we have now enabled Space administrators to delete unwanted issues on Backlog.